The matter of losing mobile phones and theft has become a common practice today. On the day the person gets to hear from anyone that his phone has fallen into the metro or bus or was stolen. At such a time, most of the problems we face are not theft of the phone but the data present in the phone. Today we are not telling you how to prevent phone theft because it can save you from being aware. 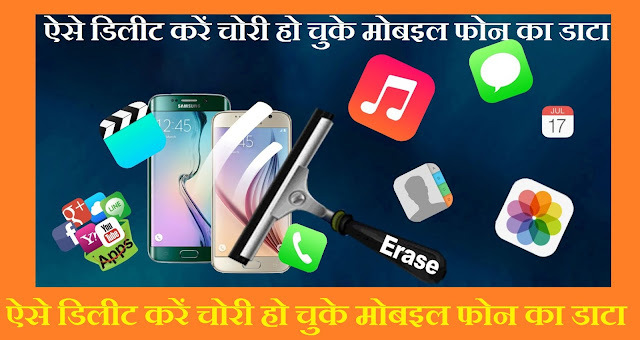 But, we are definitely telling you some such measures, which can help you delete data in the event of an Android phone being stolen. With this help, you can delete not only photos, videos, and audio files synchronized to the device with contact, messages and files. Keep in mind that this solution can only be used on Android OS smartphones. There are two ways to do this, which can be done using a Google Account. You do not need to install any new apps for this. So let's see how you can delete data from internal memory and primary SD card on your Android device. With this feature two options are available: remote wipe and wipe account. Remote wipe and wipe accounts are available on Android devices that support Android work. You can remotely delete data from your mobile device without affecting your personal data. To do this, you have to set up a work profile on your Android device. Wipe in Android 2.2 and above versions of the iOS device. Device is used to erase Google Apps data from the device without deleting any other data contained in the account. With this you can either delete only Google Apps data from your device or delete store data in the device's internal storage. Such as resetting the device's factory. If you also want to delete the SD card data, you will need to configure Google Sync or Device Policy on your device. It works only on devices running Android 2.3 or later. First of all, make sure you sign in to your Google Admin console. After that, click on the Device Management option and then tap on the mobile device. Now you can see different devices from your account listed or sync and move your cursor over to the one you want to work on. After the tap, in the second box, you will need to confirm that you want to delete the data of the device and then tap or click on Wipe Device to proceed with the process. This trick will delete all the data on your device remotely, which you will get a message about. 0 Response to "how to Delete your Data From Lost SmartPhones"